Until you convert a judgment into payment, it’s just a piece of paper. The process of execution, or seizing assets to satisfy a judgment, begins with a request to the court clerk for a Writ of Execution. This document commands the local Sheriff to satisfy the judgment through the debtor’s property in his county. What Type of Assets Can the Sheriff Seize? The Writ requires the Sheriff to first seize the debtor’s personal property (meaning non-real estate) within the county, and if the personal property found is insufficient, to seize the debtor’s real estate upon further Order. The Sheriff can seize almost any business assets, such as inventory and vehicles, but the easiest to convert into payment are bank accounts. Other assets require a sale, which involves time, expense and the uncertainty of how much the Sheriff would actually receive for them. However, the Sheriff doesn’t know what assets there are or where to find them, so the creditor needs to provide as much asset information as possible. Many times the hardest part of collecting is actually finding assets. Information about the debtor is often the key to collecting. The best source of information may be the creditor’s own file. For example, a credit application may contain bank information and a financial statement listing business assets. If the credit application is old, the information may be outdated. However, if the creditor keeps copies of all checks and wire payments, the recent payments may lead to current bank information. See discussion here about how good internal policies can help you identify assets to satisfy a judgment. While the creditor’s file is an important source of asset information, the information it produces may be limited. 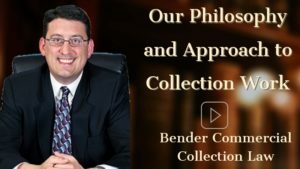 An experienced New Jersey collection attorney is often the difference between finding assets and not finding them. We have over 20 years experience recovering B2B debt. Through a combination of informal investigations, professional asset searches and the legal process, we can help you identify debtor assets and collect on your judgment. If we were the firm that obtained your judgment, we’ve been gathering as much information as possible from the beginning of the case. Gathering information early generally pays dividends both throughout the case and when you’re ready to collect. We use public records and various databases to conduct our own debtor research, which often reveals asset information. In addition, unless the creditor’s file already contains bank information, we work with reputable, reasonably priced investigators to identify bank accounts after the judgment. New Jersey law lets a judgment creditor demand financial information from the debtor, or from third parties with information about the debtor. This is known as post judgment discovery. The process generally starts with an Information Subpoena, a set of pro forma questions the debtor must answer in writing. However, the debtor’s answers tend to reveal limited information. The real heart of discovery is the next step, known as supplemental proceedings. Here, we obtain an Order requiring the debtor to appear for a deposition. At this deposition, we examine the debtor under oath about its assets and income, as well as expenses, liabilities, asset transfers, bankruptcies, etc. The same Order will require the debtor, several days before the deposition, to produce specific financial records such as tax returns, bank statements, business ledgers, loan applications and other records which often reveal a wealth of information. We can also depose or require records from third parties with financial information about the debtor, such as accountants, bookkeepers, banks, etc. If the debtor or third parties fail to comply with the Order, we can go to court to compel them. Ultimately, the court can issue an arrest warrant for their failure to comply, though our objective is simply to get the information. It’s better to get paid late than never. When you can’t find assets to seize, the judgment lien is an alternative, long-term method for securing payment. After obtaining a judgment, you can record it as a lien on real estate. The lien will attach to any and all real estate the debtor owns (or acquires) statewide. A New Jersey judgment is good for 20 years, and the lien will remain in place for the duration. At some point over the 20 years, the debtor may need to sell or refinance its property. To do so, it typically has to “clear title” by removing all existing liens. How does it remove your lien? By paying you. A judgment lien may not produce money right away, but is easy to create and can secure payment over time and without further effort. We typically record our judgment liens as a matter of course. When seizing assets proves difficult, we believe in “playing the long game” as a means to your getting paid. There’s no “one size fits all” approach to debt collection. Even after obtaining a judgment, it may be wise to settle with the debtor. It really depends on the circumstances. At one extreme, you may have a solvent debtor and a bank seizure for the full amount. At the other extreme, the debtor may be insolvent, struggling to stay in business, and you’re unable to find sufficient assets. Many cases fall in between. Ultimately, most businessmen will decide whether or not to settle, and how much to accept, based on the circumstances of each case. Why should you settle for less than the judgment amount? Because collections is an exercise in pragmatism. Unless you’re actually holding the money, your judgment is still worth the paper it’s written on. At the end of the day, it’s less about justice (the principle of what they owe you) than about the money (maximizing your recovery and minimizing your risk, effort and expense). Collection may force an insolvent debtor out of business or into bankruptcy before you get paid. When your debtor is fighting to stay in business, settlement increases your chance of getting paid by negotiating terms the debtor can afford. In the post-judgment context, we generally achieve leverage by executing on the judgment, recording your lien and forcing the debtor to provide post-judgment discovery. Gauging the debtor’s ability is usually some balance between art and science – the information we’ve gathered, combined with our intuition and experience. Where the debtor can pay you, we exert maximum pressure. Where its ability is limited, we take a practical approach. For example, if the debtor needs installment payments, we want it to stay in business in order to pay you, so we don’t want the payments to kill the debtor — but we do want it to hurt. Finally, after maximizing our leverage and gauging the debtor’s ability, the lawyer’s negotiating skill is key. 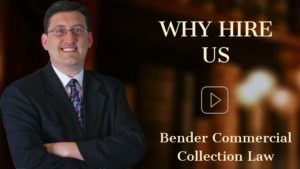 Mr. Bender is a skilled negotiator with more than 20 years’ experience settling judgments for our clients. When settling the case is in your best interest, we can help you negotiate the best possible terms.